Principally, one can distinguish between two types of super-resolved fluorescence microscopy: either when an ensemble of fluorophores (those chemical entities emitting light upon appropriate irradiation) is involved or when single fluorophores are being imaged. The former technique came into use in around 2000, while the latter has only been available since 2006; there seems to be a general trend towards shorter timespans between when the scientific discoveries/developments of a technique are made and when the prizes are awarded. Why bother with super-resolved fluorescence microscopy in the first place? It’s such a mouthful that it might not be worth the effort to develop. However, if you have a look at the following image, entitled “Untangling Neurofilaments” and submitted to the Cell Picture Show by none other than Stefan Hell, then you might realise that it is a really useful technique [image copied from the Cell Picture Show website]. 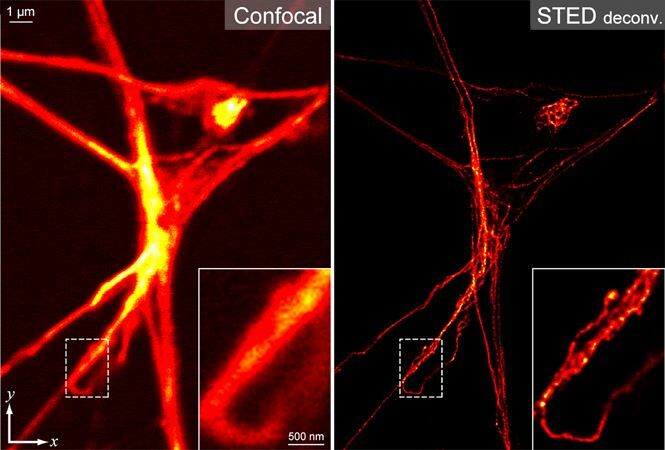 The image on the left shows neuronal filaments and was acquired using confocal fluorescence microscopy, a technique that is already more advanced than standard or epifluorescence microscopy because it only allows visualisation from a single focal plane, thus increasing contrast and resolution. On the right, however, the same filaments are imaged using a super-resolved technique called stimulated emission depletion (STED). Clearly, this second micrograph shows a lot more detail and one can distinguish different filaments from one another. This can be important when trying to distinguish pre- from post-synaptic neurons, for example. A typical bacterial cell is about 2000 nm by 500 nm and so by conventional light/fluorescence microscopy these cells can be visualised, but their internal structure cannot be resolved. Super-resolved fluorescence microscopy relies on visualising only a subset of all fluorophores in a given sample and being able to pinpoint more precisely from where the photons are being emitted (the physical explanation of this, I’m afraid to say, is beyond my capabilities; best to check here and in the references there, if you are interested). However, something I can explain links perfectly back to one of my favourite classes of proteins, the fluorescent proteins (FPs). When William Moerner was studying green fluorescent protein (GFP) mutants from Roger Tsien’s lab (Nobel Prize in Chemistry 2008), he noticed that some of them had to be activated before they would fluoresce at all and could be irreversibly turned off as well. This allowed the switching on of only a subset of FPs and the detection of these at super-resolution. Subsequently, this first subset is switched off and the next subset turned on, so that sequentially all FPs can be imaged and the whole picture put together. The method is called PALM (Photoactivated Localisation Microscopy). Just like with the CRISPR Craze, I first heard about these microscopy techniques last year in a supervision: one of the M.Sci. students was presenting her project which involved PALM imaging of an enzyme as it moved along DNA; to control for the fact that the DNA itself might be moving she tracked a histone variant (histones are proteins that associate with DNA to facilitate its tight packing) and used it as a proxy for DNA movements. Oh, and have I mentioned that I love cells? If you do too, then maybe one of the activities at Biology Week will tickle your fancy. This entry was posted in Factual and tagged biology, Chemistry, GFP, microscopy, Nobel Prize, PALM, Science, super-resolution, tool by Victoria Wang. Bookmark the permalink.